ONLY A FEW TO SELL! FOR DISPLAY PURPOSES ONLY. ITEMS ARE NOT INCLUDED! This is the BAE Systems Display Panel Part Number 3089 for their MOLLE Gear. Measures 30' x 48". Grommets allow hanging of the display panel. Used for Defense Trade shows and retail stores. This is a nylon panel with webbing loops only! Pouches are not included. 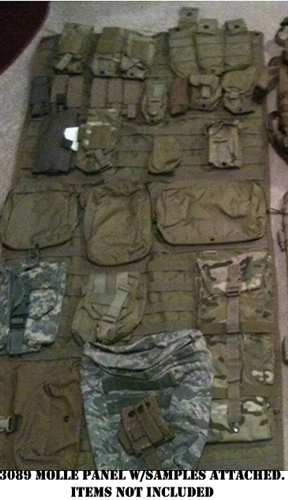 Great for display of a selection of MOLLE/PALS accessory pouches and kit. Universal Camouflage Pattern ACU (Coyote shown as reference only).